Aranjuez, October 25, 2017. 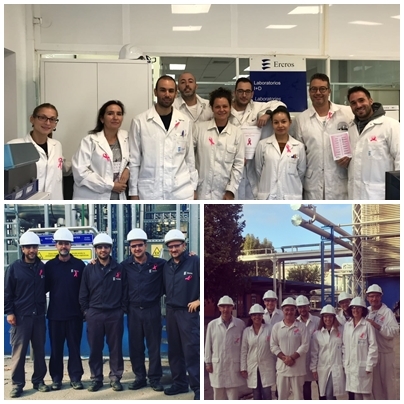 - The Ercros’ factory in Aranjuez has carried out a campaign to raise public awareness about breast cancer in response to the call of the World Health Organization (WHO), which has chosen this October to encourage actions to increase care for this disease, support women who suffer from it, promote early detection and treatment and palliative care. Following the proposal of the factory’s Prevention Department, personnel who works in the factory, either the own staff or contractors, and also the visitors have been given a set of cards with myths and realities about breast cancer and a pink bow to show off at work. According to WHO, early detection is the cornerstone of the fight against this disease given the insufficient current knowledge of its causes. When it is detected early, an adequate diagnosis is established and treatment is available, the possibilities of cure are high. In contrast, when it is detected belatedly it is rare that a curative treatment can be offered. In such cases palliative care is necessary to mitigate the suffering of patients and their families.